As many as 57 trees that spread in 10 sub-districts, South Jakarta have been pruned.
" 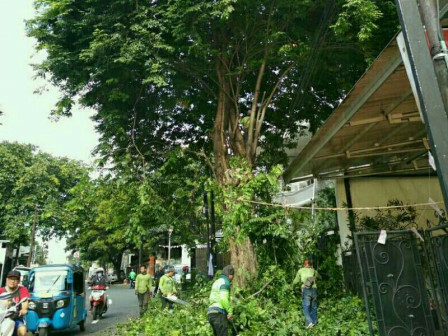 Tree pruning that is done in Thursday-Friday is focused on trees that are prone to fall"
"Tree pruning that is done in Thursday-Friday is focused on trees that are prone to fall," expressed Bambang Muhirdan, Section Head of Forestry for South Jakarta Forestry Sub-dept., Friday (11/16). Types of those 57 trees are starting from mahogany, angsana, pucuk merah, banyan, tanjung trembesi, and glodogan. In details, 3 trees of them are pruned in Cilandak, 10 trees are in Jagakarsa, 14 trees are in Kebayoran, 4 trees are in Kebayoran Lama, 6 trees are in Mampang Prapatan, and 5 trees are in Pancoran. "After being pruned, those trees are brought to the Gg Manggis TPS," he stated.